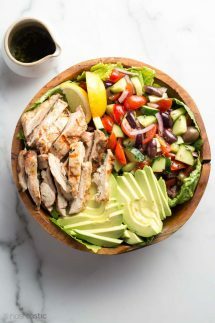 I promise this is not a complex salad to create, but I’m going to show you three ways to cook the chicken and then you can pick the method that’s most convenient for you! 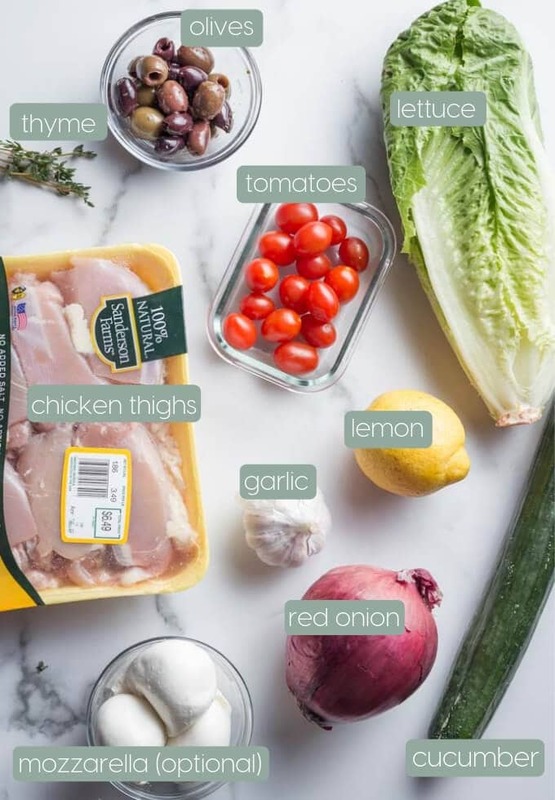 Start by assembling all the ingredients you’ll need for the grilled chicken marinade. You can see them in the photo below and they include lemon juice, olive oil, fresh thyme, salt, garlic, and pepper. 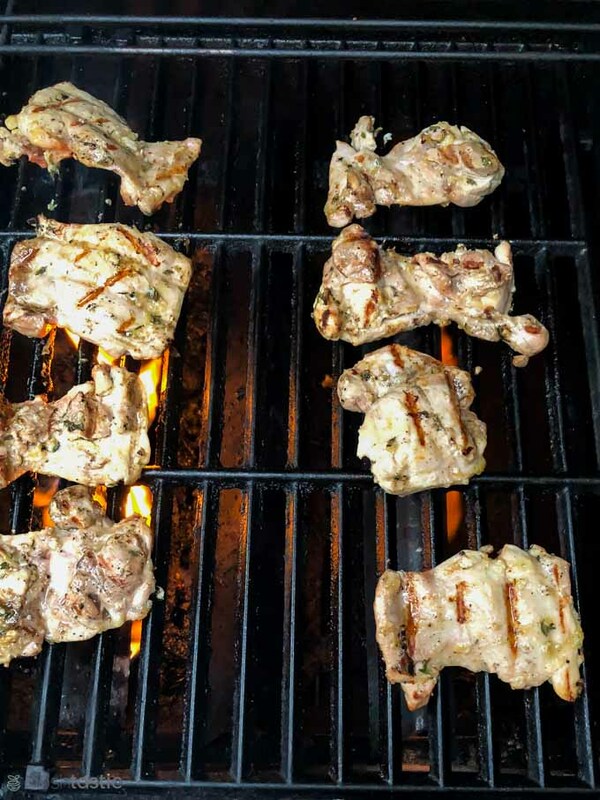 Mix the marinade together and pour over the skinless boneless chicken thighs (see photo below) and turn the chicken pieces around in the marinade so it’s evenly coated. Marinade for at least one hour. Now you have a choice of how to cook your chicken! You can cook it on a grill like I did in the photo below, or you can opt for a skillet, or bake it in the oven. It took about ten to fifteen minutes to grill it, and I turned it a couple of times. Watch out for flare ups and if that happens move the chicken away from being directly over the flames. And finally, check it with an instant read thermometer to ensure it’s fully cooked. I often cook it in a cast iron skillet if I don’t want to fire up the grill and it’s really easy. Just get the skillet hot, add a little oil, and then cook for five minutes per side, turn it over and cook for five minutes more. The cook time will vary depending on the thickness of the chicken, so again check it with a thermometer to be sure. Turn the oven to 400F and line a sheet pan with parchment, or use a wire rack over the sheet pan and lay the chicken on that. It will take about 25 – 35 minutes to cook fully. 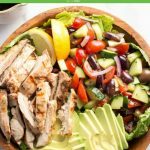 More Mediterranean Chicken Salad Tips! Use the FULL marinate time, it will make a big difference in the finished flavor of the salad. When using a skillet to cook the chicken make sure it’s properly hot so you get a great finish on your chicken. If you want to change up the salad vegetables you can swap them out for any others you prefer. Extra vinaigrette dressing can be kept it in the fridge for later. 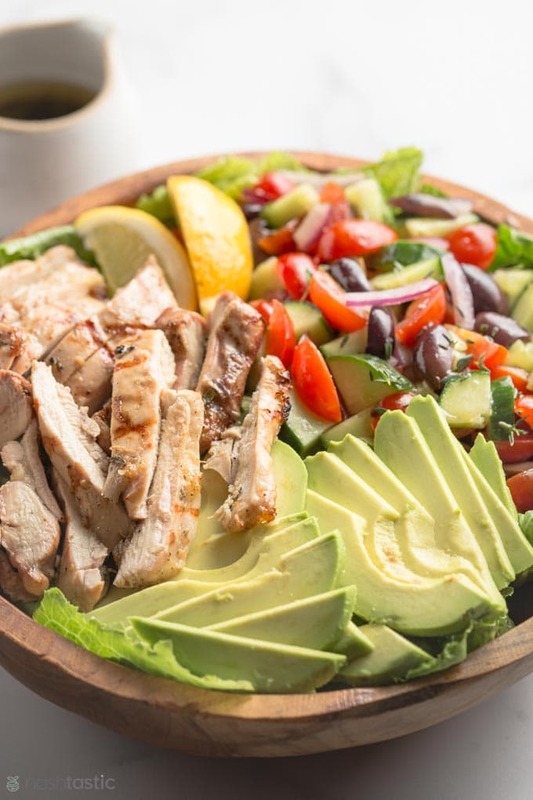 Can I make this Mediterranean Chicken Salad Ahead? Yes! you absolutely can make this ahead of time. I would recommend cooking the chicken, prepping the vegetables and making the dressing ahead of time. Then, when you are ready to serve the salad you can assemble it, this will ensure that the salad isn’t soggy when you go to serve it. 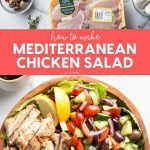 Quick and Easy Mediterranean Chicken Salad recipe you'll love! With options to cook the chicken on the grill, in a skillet, or in the oven. 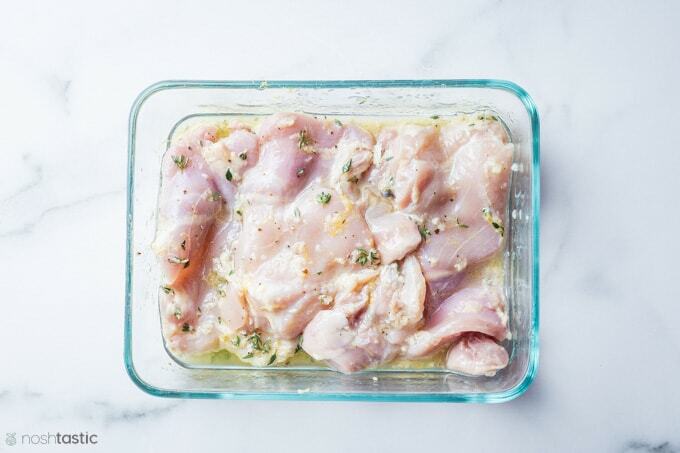 Mix together the Mediterranean Chicken Marinade and pour over the chicken. Marinate for 1 hour. Cook over direct heat for around five minutes per side, exact time will vary. Check if the chicken is cooked with an instant read thermometer. A cast iron skillet is best for this. Use a little oil and get the skillet hot then cook the chicken for about five minutes per side. Cook time will cary depending on the thickness of the chicken. Check if it's done with an instant read thermometer. Place the chicken thighs on a parchment lined sheet pan. Do not use foil, the chicken may stick to it. If you have a wire rack that fits over a sheet pan that's also a great way to cook it. To make the Balsamic vinaigrette simply whisk all the ingredients together until the oil and vinegar are combined. Assemble your Mediterranean chicken salad by adding the romaine lettuce, arugula, baby spinach, avocado, sliced grilled chicken, tomatoes, cucumber, olives, red onion, and any other salad toppings you like such as cheese. Pour over the salad dressing (you may not need it all) and toss the salad. After I read this I saw that the total fat and saturated fat was too much. Also the sodium was way too high. Is all Keto recipes so high in fat and sodium? Most of the salt is from the olives, they tend to be salty so if that’s an issue you can of course omit them or substitute with something else. 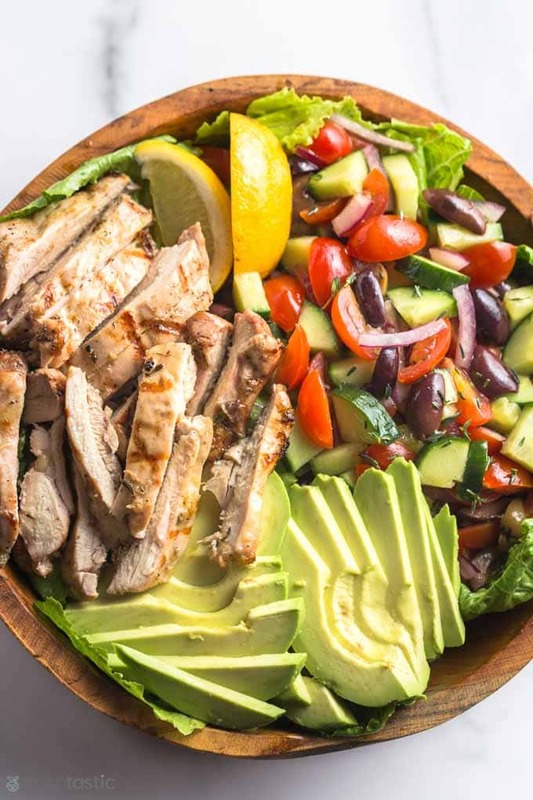 The Keto diet is not intended to be a a low fat or low calorie diet, quite the opposite in fact as fat tends to keep you full and does not spike your blood sugar like refined carbohydrates can.